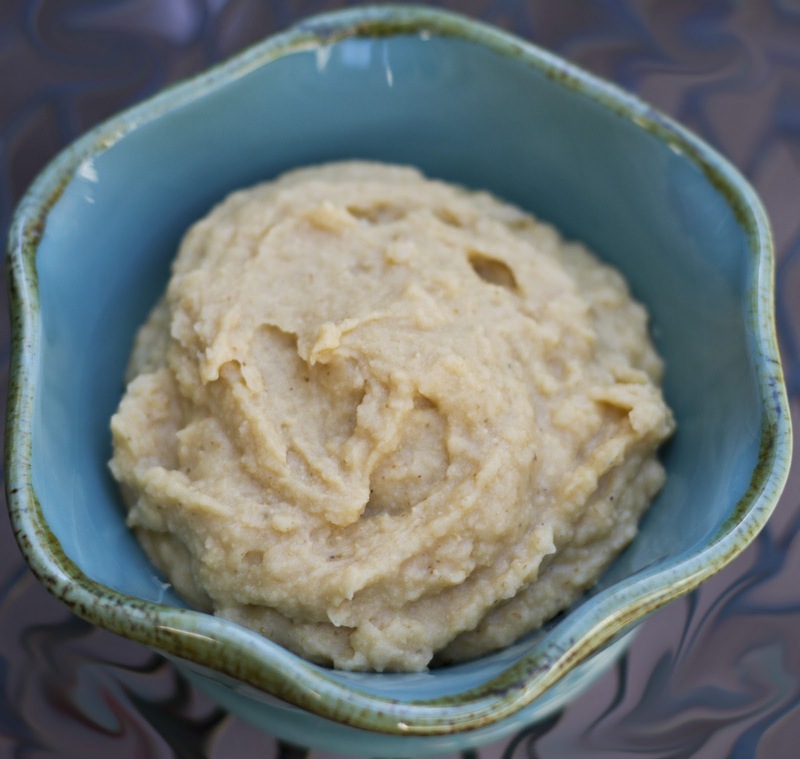 I LOVE hummus but was sad when I looked at the fat and calorie content on my favorite kind recently and discovered it wasn't quite as healthy as I thought :-). I've been wanting to try making my own for awhile now but it seems like the recipes I would find called for tahini and I could never remember to buy it. Then I saw this version on Fit Family Meals and couldn't pass it up. 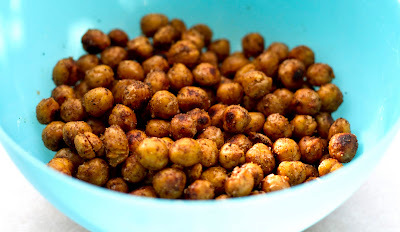 It was super easy, tasted great and is totally good for you...Hooray!!! 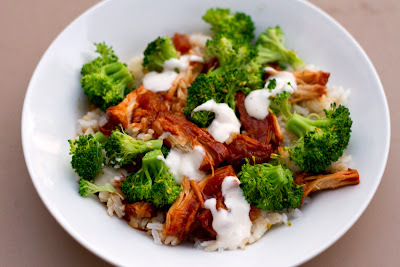 This recipe is from Kill the Gluten and I decided to try it because it looked good most importantly, I love broccoli and it used a crock pot. It was really good, pretty healthy and the ranch was a fun addition I wouldn't have thought of on my own. They mentioned that they have made it with pork too and that it was just as tasty. Place meat in 3 1/2-5 quart slow cooker. Combine pineapple and barbecue sauce and pour over meat. Cook on high heat for 3-4 hours or on low for 6-8 hours. Layer in bowls: rice, chicken, broccoli, and a little ranch dressing. Makes 4-6 servings. Another tortilla soup recipe?! Yep :-)! 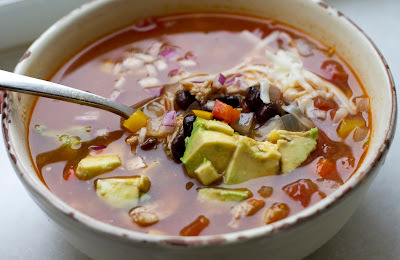 I think I need a separate category devoted to tortilla soup. 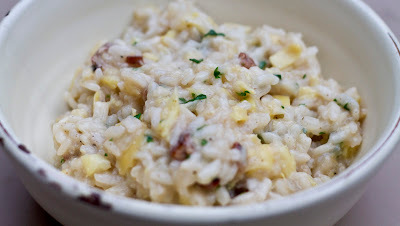 When I saw this on The Pioneer Woman's site recently I knew I would have to try it. Was it good? Super good. Was it worth all the work to make it? Not in my opinion. Although the soup was tasty, I have had equally tasty tortilla soups that are a lot less time consuming to prepare, so I may add some elements from this one (like the bell peppers) to some of my other favorites but I don't know that I'll actually make this exact one again. 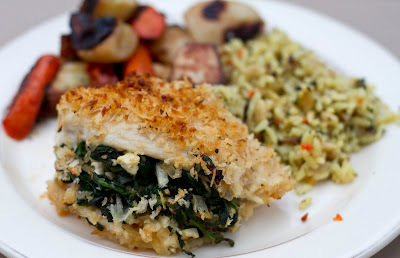 This is yet another Rachael Ray magazine recipe, and I think the last one I saved from her most recent issue. This was also my favorite of the ones I tried! It was SOOO delicious! I was glad it made enough for a couple days worth of leftovers for lunch because I looked forward to it every time. Even my kiddos ate most of theirs which shocked me...and made me happy :-)! The nuts give the meal enough substance that I don't even think you miss the meat. -In saucepan, bring the broth and 4 c water to boil, cover and keep at a simmer. -In large saucepan, melt 2 T butter over med heat. Add the onion and cook, stirring, until softened, about 5 minutes. Add the rice and stir until lightly toasted, about 2 minutes. -Stir in 1 cup of broth mixture, bring to a simmer and cook, stirring, until the liquid is absorbed, 2-3 minutes. Maintaining a low simmer, continue to add the broth mixture, 1/2 cup at a time, stirring frequently and allowing the rice to absorb the liquid. Cook until the rice is tender, about 20 minutes. -In the last 3 minutes of coking, add the artichoke hearts, lemon peel, lemon juice and the remaining 2 T butter; season with salt and pepper. Stir in the cheese, parsley and nuts. This is another Rachael Ray recipe and was a great introduction to some new vegetables for me. I had never tried turnips or fennel and still haven't tried parsnips because I didn't find them at the grocery store I was at. I was a little nervous about the fennel, but ended up loving it, and didn't love the turnips...the potatoes I added were definitely better. I cut this recipe in half for our family. -In large bowl, toss the turnips, carrots, parsnips and fennel with the olive oil; season with salt and pepper. -Meanwhile, in a small skillet, cook the butter over medium heat, stirring frequently, until golden-brown, about 5 minutes; stir in the sage and season with salt and pepper. Add to the vegetables and toss to coat. This a recipe from Rachael Ray and it turned out super, super yummy. I put a little less stuffing in my kids' chicken because I wasn't sure how they would like the feta and spinach, but they ate it all, so next time I'll just make it like ours. It's always fun to serve a chicken dish that looks so fancy too :-). -Heat 1 T EVOO in small skillet over med heat. Add the onion and 2/3 of the garlic and cook until softened, 3-4 minutes. -Transfer to a bowl to cool, then add the spinach and season with salt, pepper, and nutmeg. -Melt the butter in the same pan, turn off the heat and add the panko, oregano and remaining garlic; toss. -Drizzle baking dish with remaining 1 T EVOO. Split each chicken breast across (but not all the way through) and open like a book. Stuff with the spinach and feta, letting the stuffing overflow at the edges. -Place chicken pieces in the baking dish and top with the breadcrumbs. Bake until the juices run clear, about 20 minutes. This is another recipe I saw in All You magazine and wanted to try. I am definitely a snacker, so when I am trying to be healthy it is key for me to have healthy snacks available or I will go for my trusty chips (oh, how I love chips!). These little guys were easy to make and crunchy and flavorful. I'm hoping the leftovers taste good too because even Addie loved them and they'd be great to have on hand! This recipe was in a recent issue of All You magazine and it looked easy and yummy and not too bad for...especially when you use turkey sausage instead like we did. I love roasted EVERYTHING :-) and this hit the spot! Preheat oven to 450 degrees. Line a large baking sheet with foil and mist with cooking spray. In a large bowl, toss peppers, onion and potatoes with olive oil, oregano, garlic salt and pepper. Spread vegetables on baking sheet. 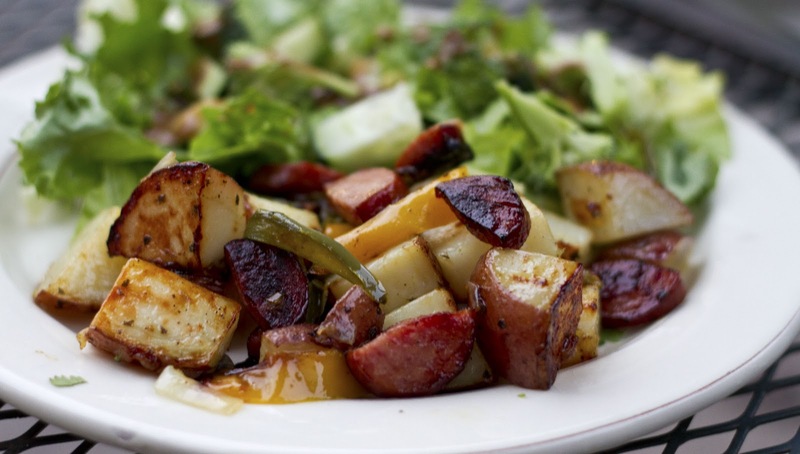 Distribute sausage chunks among vegetables. 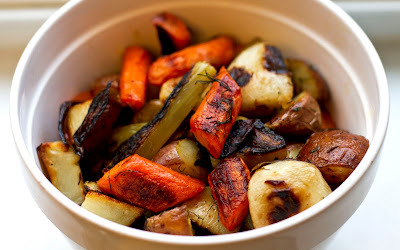 Roast until veggies begin to caramelize and sausages are cooked through, about 30 minutes, stirring once or twice during baking. I adapted this recipe is from a site I used to visit often but sadly isn't posting new recipes, Kill the Gluten. 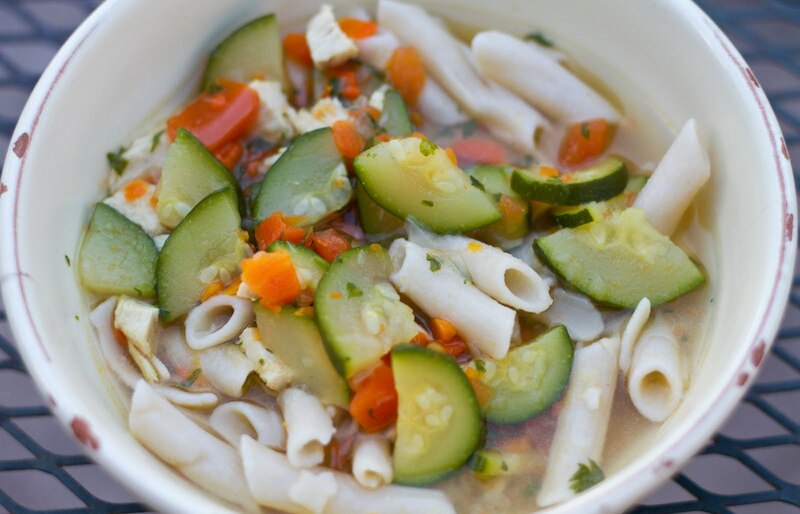 You can use whatever noodles you like and you could mix it up with any variety of vegetables as well. Leaving the noodles separate has helped make the leftovers stay delcious...and having the leftovers in the fridge has been an easy and healthy lunch to go to. Aaand my kids ate up every bite in their bowls! Boil chicken with water and bouillon. When chicken is mostly cooked, add all the vegetables and bring to a boil. I added vegetables as I chopped them and did them in order of those that needed more time to cook (garlic/onions, carrots, zucchini and then tomatoes). While this pot was cooking I cooked my noodles in a separate pot (gluten-free noodles fall apart easily, so it may not be necessary to do this with regular ones) When it was time to serve the soup I added noodles to each bowl. I have been storing them separately in different dishes in the fridge and it has worked perfectly!